Mostly a painter, Peter Stampfli has also authored several monumental public sculptures, as well as films dealing with the same subject matters as those of his paintings. Exemplary of European Pop Art, his large canvases usually depict oversized household objects of jagged edges. Auto parts are a regular presence in his oeuvre, especially gigantic tyres and the patterns they leave on a surface. Stampfli’s oeuvre places the automobile within the iconography of modernity, as a standardised image in which our culture recognises itself. The car, however, also establishes an intertextual relationship with recent art history — suffice it to mention some futurists’ experiences, as well as the figurative tradition of Surrealism and Pop Art, to understand the role of this machine, which revolutionised land travel, as a motif in 20th-century artistic practices. 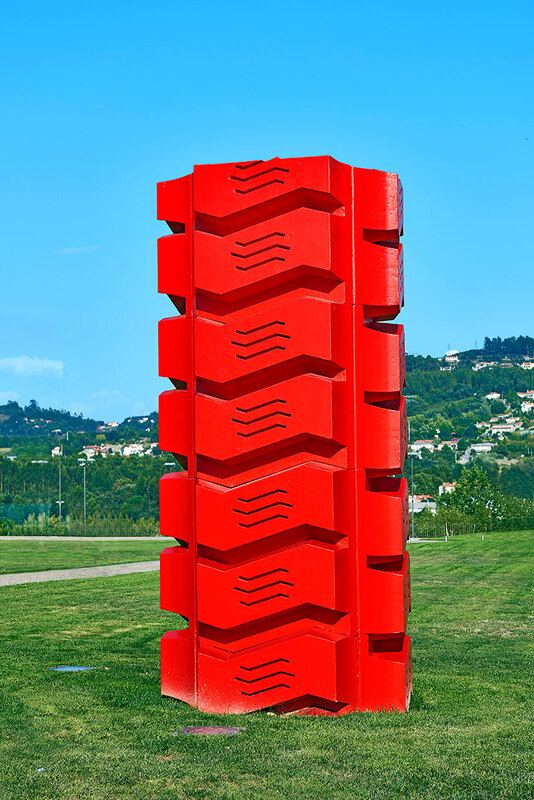 The piece designed for the 7th Santo Tirso International Symposium of Contemporary Sculpture takes up the legacy of car iconography, by featuring once again the textures of tyre tracks. To put it shortly, the monochromatic totemic sculpture reproduces gigantic tire tracks in the round, representing an object whose abstract dimension causes both strangeness and familiarity.